Torque-Rite® allows you to control compression and expansion while maintaining constant inch/pounds force insuring a Perfect Surface I.D. when used with a Rubber Fab sanitary gasket! Torque-Rite® eliminates the problems associated with over – or under-tightening a gasket which can lead to an unsanitary system. When tightened, the Torque-Rite®’s self-limiting internal mechanism will make an audible “click” signaling the user they have reached proper inch/pounds force. If further tightening is attempted, there will be more “clicks” but no additional application of force on the gasket (if emergency conditions arise, the Torque-Rite® has a built-in manual override feature). 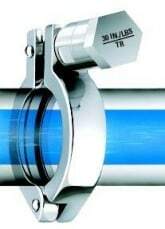 Over-tightening can tear or damage a gasket and can also cause a damming effect inside the pipeline. A torn or extruded gasket can hold soil and bacteria. Under-tightening leaves an undesirable concave area at the gasket allowing soil and bacteria to become entrapped. Both conditions should be avoided in a sanitary system. Maintaining a “Perfect Surface” Sanitary System. By maintaining a constant force on a Perfect Surface Gasket with the Torque-Rite®, gasket I.D. is maintained lowering bacteria count and enhancing product integrity. A Perfect Surface sanitary system is assured.